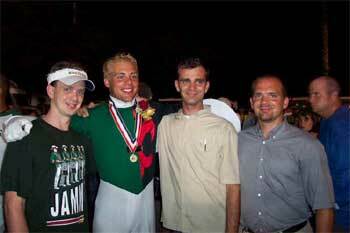 James Newcomb submitted this one: "This is a shot of the Newcomb brothers and was taken right after Finals in Orlando This was the first time that all four of us had ever been at a drum corps show together, even though we all marched with the Madison Scouts at one time or another. From left to right is Paul (2000-2001), Jon (2000-2003), myself (1994) and Dave (1996 and 1999)." Thanks James!